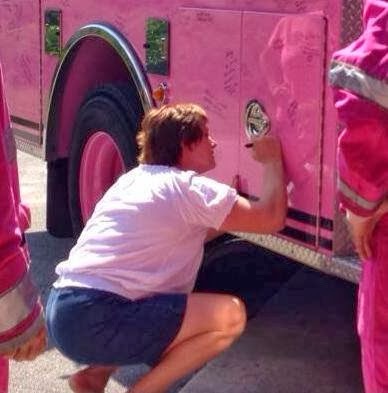 A firefighter in a pink firetruck wearing a pink fire suit? I never thought I'd see it. 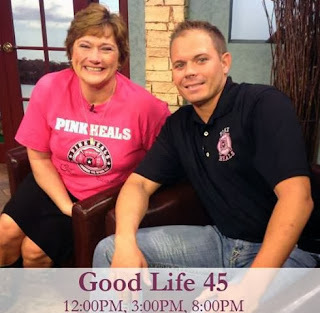 But that's what I saw this week in a TV interview with Josh Baker of Pink Heals and Liesa Miles, a beloved Spanish teacher. The interview aired on The Good Life and can be viewed here. Most of us call her Profe (short for professor), a perfect name for one whose life is a lesson in strength, courage, and faith. She is our Profe! "Know that you must rest on Scripture. We've never been promised easy, we've never been promised health.... In fact, quite the opposite ... we will have times of trouble, and those are the times when we persevere and we get stronger and we grow. And it is our job to bring attention to God during those times." This inspiring woman of faith has kept her sense of humor, radiance, and joy while walking a tough path. She jokes, "I'm not a girly girl and that is the joke, that God sent me breast cancer so I'd have to wear pink." Profe reminds me of my mother, who walked through the challenge of breast cancer with courage, grace, and dignity, never losing her joy or her selflessness. Her example and legacy still impact my life. More than twenty years later, she continues to inspire all who knew her. This resemblance is precisely why Profe is in my heart so strongly. I can see my mother's love, strength, and integrity in her. I also love seeing how she allows God to use her to strengthen others through her suffering. That is a tremendous gift. I've come to understand something powerful about healing, compassion, and our bond as human beings. There truly is a purpose in suffering, and this realization transforms the experience into something helpful and even hopeful. Redemption is possible. In fact, with Christ in our lives, redemption is our destiny. For "we know that in all things God works for the good of those who love him, who have been called according to his purpose." I leave you with some verses that help us understand the purpose of suffering a little bit better. I am thankful for people like Profe and my mother who help us learn to suffer with grace, faith, humor, dignity, and purpose. Thank You, Lord, for blessing my life with people like them. I want to know Christ—yes, to know the power of his resurrection and participation in his sufferings. Therefore, since we have been justified through faith, we have peace with God through our Lord Jesus Christ, through whom we have gained access by faith into this grace in which we now stand. And we boast in the hope of the glory of God. Not only so, but we also glory in our sufferings, because we know that suffering produces perseverance; perseverance, character; and character, hope. God's ways are the path of life. May we rest on His promises and follow only Him, the source of strength, hope, and life. For more inspiration, see Living on Mission: What's That All About?